Jaqueline de Lacey (christened 1199) is an Anglo-Irish noblewoman and a companion of the Academica Septima Superior. She also commands the mercenary crossbowmen who garrison Cruggleton and Eilean castles. Jaqueline is the daughter and eldest child of Bertrand de Lacey, Baron Carlow, and niece of Hugh de Lacey, Earl of Ulster. Her father was, and continues to be, a loyal vassal to his brother, and this tradition of aggressive loyalty clearly made an impact on the young woman. While her family wanted nothing more than an advantageous marriage for her, her tutors nurtured her interest in martial pursuits. The young Jaqueine would remove herself from castle Carlow on the pretext of going on a 'spiritual retreat' to a nearby nunnery. Instead, her tutors would secure the services of landless knights-errant to teach her swordplay and something of military leadership. Of course, Jaqueline could not pass among her kin without showing a little appropriate learning. She learned the appopriate etiquette for a border Baron's daughter, and a smattering of ecclesiastical Latin. She also accompanied her father and brothers on their falconing expeditions, where she displayed no ability whatsoever to control a bird, but developed a feel for horses that has made her one of the greatest riders in Christendom. Jaqueline has two younger brothers. Both of them have sworn fealty to their father, and both supplement the income from their manors with paid service to other lords, Norman and otherwise. Upon her coming of age, Jaqueline's hand was promised to John Courcey, a landless nobleman who nonetheless commanded a significant fortune due to his success as a mercenary. Shortly before their marriage, however, she absconded from her family's castle, taking with her a handful of crossbowmen whose loyalty she had won. While her father was dismayed by his daughter's rebellion, Courcey was enraged, as the dangerous lifestyles of Jaqueline's brothers had left him with a good chance of inheriting her father's land and title through their marriage. Jaqueline led her small band through several successful engagements in Ireland, showing notable success in eliminating brigands. In such an engagement, Jaqueline would typically adopt the guise of a noblewoman travelling with a tiny guard and travel through an area known to be haunted by robbers. The remainder of her slowly-growing company would shadow her away from the road, providing a counter-ambush when outlaws were encountered. This martial success led to public praise from her uncle, and a reconciliation with her family. John Courcey, however, has pursued an ongoing feud, even going so far as to offer his services to her employer's rivals in order to provoke a fight. Tired of this harassment, Jaqueline and her company travelled to Scotland to seek patronage. 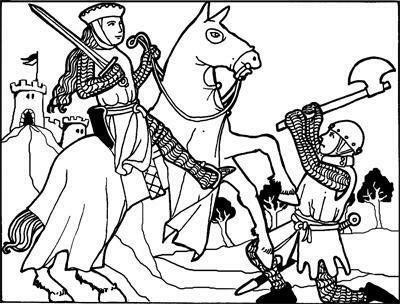 She found it in Alan, Lord of Galloway after entering a tournament at Wigtown in 1220 and capturing Sir Gilbert the Stalwart without dismounting. Though widely considered an upstart woman in a man's world by Norman nobility, Lord Alan appears to like her brash, outspoken nature. He has awarded her a long-term contract to supply a garrison of crossbowmen to both his castles in Galloway. This has almost certainly dissuaded invasion by Dumfriesshire barons, and has provided Jaqueline with significant personal wealth. Some of this she donates to the Academica. In return, she receives a safe, secluded and non-judgemental bolt-hole, and useful contacts among the Order of Hermes in Scotland.